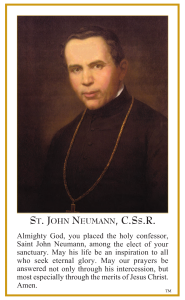 We invite you to express an interest in bringing the relic of St. John Neumann to your parish. Our hope is to offer your parishioners and visitors an opportunity to encounter this great Redemptorist saint in a very personal way and to invite those who attend to enter into a fruitful and lasting relationship with this holy, humble, and powerful disciple of Jesus Christ. Each reliquary visit is uniquely designed, and a personalized plan can be developed to determine the dates and length of stay as well as how the visit can best be tailored to serve the specific needs and desires of your parish. For example, the visit could be incorporated quite effectively into the Saturday/Sunday Mass schedule, or, if you would prefer, a separate time could be designated in the afternoon or evening for a prayer service outside of the Mass. As part of the planning process we would discuss possible accommodations for the Redemptorist priest who will conduct the visit to your parish as well as travel expenses and a free-will offering. As fourth bishop of Philadelphia from 1852 to 1860, John Neumann was deeply committed to the personal care of all the faithful of his diocese. His greatest desire was to enter personally into the lives of those he served, and he worked tirelessly to be actively present to them in matters of faith and the everyday struggles of life. As many faithful have attested, he continues to be tirelessly present and active in the lives of those who call upon his miraculous intercession. Fr. 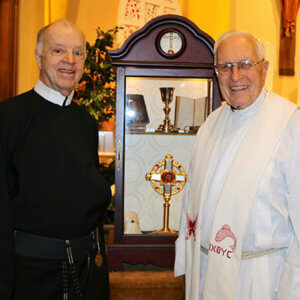 Ray Collins made a trip to Ohio, taking St. John Neumann relics with him. See more photos from his visit. We thank you for your desire to invite this humble and powerful saint to come to your parish, to enter your homes–to become a part of your lives. To schedule a visit or learn more, please contact Deborah Binder, our Assistant Shrine Director, at 215-627-3080, extension #115. 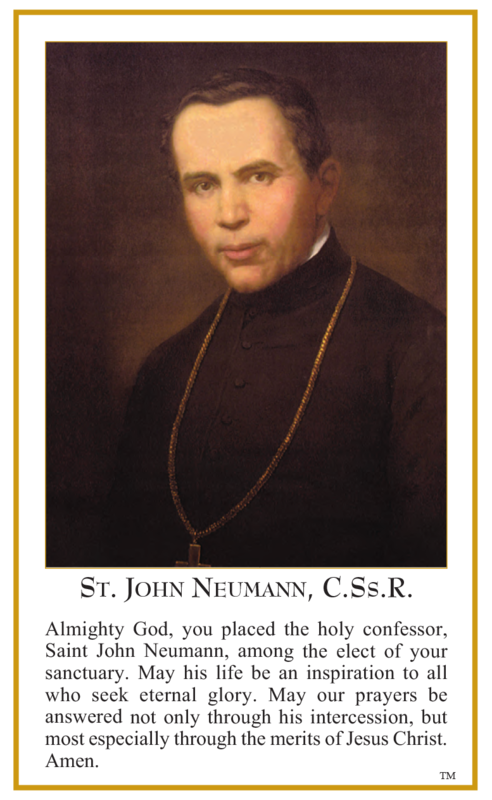 From the National Shrine of St. John Neumann, we pray that God’s richest blessings be with you all.